The MarketingMel team supports #Socktober: Kid President’s drive for new socks for the homeless. MarketingMel, is teaming up with YouTube sensation “Kid President” in a nationwide campaign to donate socks to the homeless. “Socktober”, stamped by Kid President himself, is a movement to motivate one-million people to donate socks to the homeless in their communities. The campaign was launched by a YouTube video declaring the month of October, “Socktober.” Our goal is to to get 500 pairs of socks donated to United Way of Washington County, TN for distribution by Thanksgiving! It’s ambitious but we live in a generous community with many wonderful small businesses and non-profits who have already jumped in to help. Donations are being accepted now through Thanksgiving. Drop-off stations are located at Summit Leadership Foundation, Spine & Sports Chiropractic and Appearances Hair Salon. As an extra incentive to donate new socks, Spine & Sports is offering one half off kinesio taping for anyone donating new socks to their office at 215 East Watauga, Suite 100. That is a $10 savings from the normal price of $20 for tapings. If you don’t live in the Tri-Cities region I hope you’ll be inspired to purchase new socks for the homeless in your area. Please drop us a note and let us know how you are doing in the comments section. By the way do you like the socks Sarah and Emma and i are modeling? Nothing says #Socktober like orange! Socktober is a great idea! Thanks for sharing the event’s purpose with us, Mel. 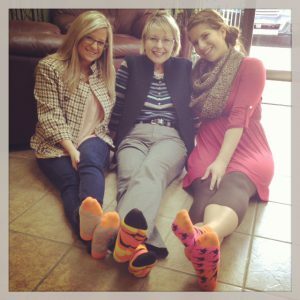 Socktober is the perfect opportunity to get involved with helping your community! There are so many people who will benefit from these socks. I am so excited Team MarketingMel is heading this up for Johnson City! I’m glad you’re on the team to support #Socktober Sarah! What a great idea, Mary Ellen! It always warms my heart to see how others are making a difference through simple acts of kindness like this. This is fantastic. The colorful socks in your photo remind me of Seth Godin (although his would be mismatched). Maybe you should get him involved? Great suggestion Lisa! Thanks. I will reach out to Seth. It couldn’t hurt. What a wonderful idea! and well done for being involved in this! Thank you Trudy! So far #Socktober is working!